Advance Wars was an interesting series, born on the famicom and built well around its hardware limitations. The most widely known iterations were on the Game Boy Advance and Nintendo DS. There were attempts to bring spinoffs to the Gamecube and Wii, but they missed the point of what people wanted – the same charming turn-based strategy game, but on a big screen. It’s been more than ten years since the last installment, and the series has all but vanished. 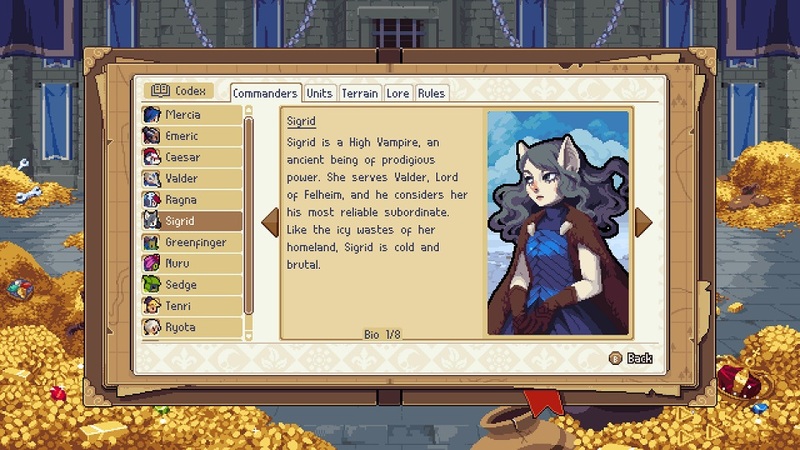 Now, developers Chucklefish (makers of Starbound) have delivered the spiritual successor that fans have been clamoring for, along with some modern updates like level creation/sharing and asynchronous multiplayer across Xbox, PC and Switch. 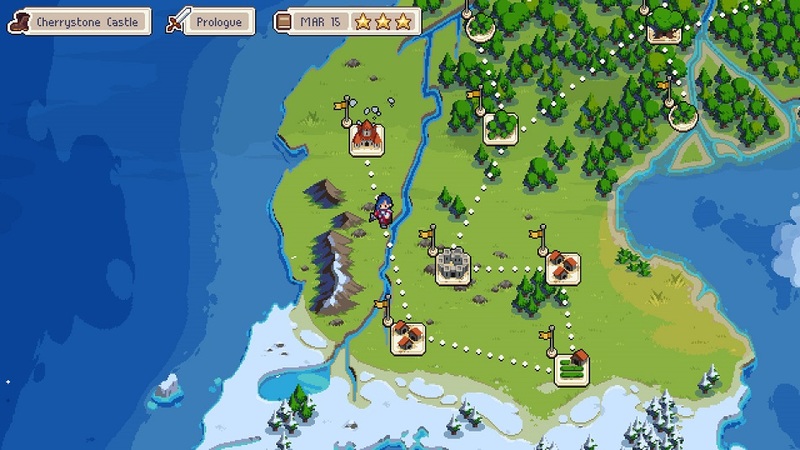 Wargroove has players move units around a 2D grid-based map from a top-down view. When units come into conflict, the camera switches to a side-on perspective. All the artwork is beautifully rendered in Nintendo DS callback style, and the characters are wonderfully expressive. The campaign follows a deposed monarch, Mercia, as she fights to take her kingdom back from the undead with the help of an ever-expanding group of commanders. It also serves as the tutorial for movement, unit building, understanding map management, and other aspects of play. Each map is broken up by roads, rivers and mountains and they provide modifiers depending on the units placed there. There are also Villages that generate money each turn and Barracks, Towers and Ports that can be used to build units. Each unit has strengths, weakness, and special conditions for critical attacks. In essence it’s a balance of rock-paper-scissors between units, and the configurations gets more elaborate as exotic units like harpies, war turtles and dragons get added to the mix. The interludes between missions are sharp and well written, and provide narrative motivation for each skirmish. In one, Mercia must travel at night, requiring coordination between canine spotter units and long-range snipers. Another encourages the use of fodder units to slow down titan-sized enemies so that trebuchets can tear them apart. Every mission has a star and letter ranking that are independent from each other, but it’s unclear how they’re unlocked and it’s not explained in-game. All I knew is that shifting the difficulty sliders reduced my star score. After Act 3, Mission 3 I was using those sliders a lot. The AI knows exactly where to place itself to avoid being in range, so for most clashes it required me to goad them into a trap, or slowly inch them into a corner and pummel them. This was fine early on, but by the end of Act 3 there are complications that emerge, like infinitely spawning enemies and maps where the enemy has three times more resources, units, bases and spending power than the player does — everything after this point is a brutal slog on Normal difficulty. Also, the point when a battle becomes unwinnable can be hard to discern, so it was common to find that I’d ‘lost’ 40 minutes before I knew it, and there’s no option to manually save and try out certain gambits. The difficulty sliders (damage taken, money earned, time for commander special ability recharges) are a good idea but because shifting any of them immediately limits a player to only getting one star means that it seems pointless to do anything than slide them all the way to Easy. Why would I make the game just a little easier when the penalty is the same as making it very easy? The single-player Arcade and Puzzle modes fare much better than the campaign. Arcade is more balanced in terms of resources, and the AI seems to ramp up smartly rather than simply overwhelming with numbers. Puzzle Mode is a series of challenges that must be won within a single turn, reducing Wargroove to its purest form. In fact, this mode actually helped me understand terrain and advanced tactics. The asynchronous cross-platform play between Switch, PC and Xbox is great, only requiring a shared six-character code to get in and then the instance of the map is stored so that players can log in and play when they wish. 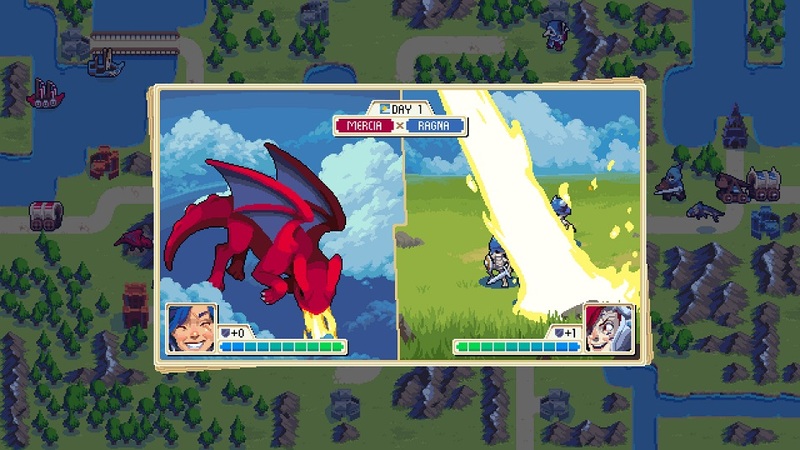 The introduction of human fallacy and unpredictability makes Wargroove shine and shows what the developers have constructed in the best light as impasses are created and sunk cost fallacies prey on a player’s mind. Similarly, one recent session saw me teaming up with another player and ganging up on a third — while distrust between us remained, this uneasy truce was marvelous. There are a wealth of custom maps already, and many feature experimental modes including triple co-op, survival modes, and even some ‘Stardew Valley v2.0’ and ‘Advance Wars 2 Campaign+Cutscenes’. With over 300 maps available as of the time this review was written, there is a wealth of content to tackle. Disclosures: This game is developed by Chucklefish and published by Chucklefish. It is currently available on XBO, Switch, and PC. This copy of the game was obtained via publisher code reviewed on the XBO. Approximately 10 hours of play were devoted to the single-player mode, and the game’s campaign was not completed. 3 hours of play were spent in multiplayer modes. Parents: According to the ESRB, this game is rated E10+ and contains Fantasy Violence and Users Interact so there may be graphic map content depending on how many penises get built. The game is about war but the developer seems to have gone to great lengths to avoid distressing imagery, even going so far as to make defeated dogs run away rather than be killed. There is no gore although there are death cries, and the tutorial of the first campaign follows a vampire as she goes to kill the main character’s father. Colorblind Modes: There are colorblind modes available in the options: Red-Green and Yellow-Blue. I still lose track of the pointer sometimes despite this being switched on, otherwise it’s great to see this implemented in a game where color differentiating is essential. Deaf & Hard of Hearing Gamers: The game is fully playable without sound. All information is supplied via text and the game in multiplayer even helpfully replays turns that a player may not have witnessed due to not being logged in. The text size is not adjustable. This game is fully accessible. Remappable Controls: No, this game’s controls are not remappable. There is no control diagram. The left stick controls the pointer, while the right stick controls the scrolling the map. The A button is used for confirming/selecting actions/units, the B button is used for canceling actions and sometimes for learning more about a unit. LB/RB are used for scrolling through certain menus, and the LT/RT are also used for scrolling through some menus. Y and X buttons are used for some menu navigation. The Menu button brings up the pause menu. To the developer’s credit they have already started addressing the problems I had with the game by changing the difficulty settings, amusingly, the default setting that the game was set to is not ‘Hard’, which is 100% correct. It’s good to hear that Chucklefish fixed and updated things in Wargroove. It’s already an awesome turn-based tactics video game, but some bits of important tweaks make it better. What I really love about this game is its availability throughout the entire 8th gen consoles, including PC. 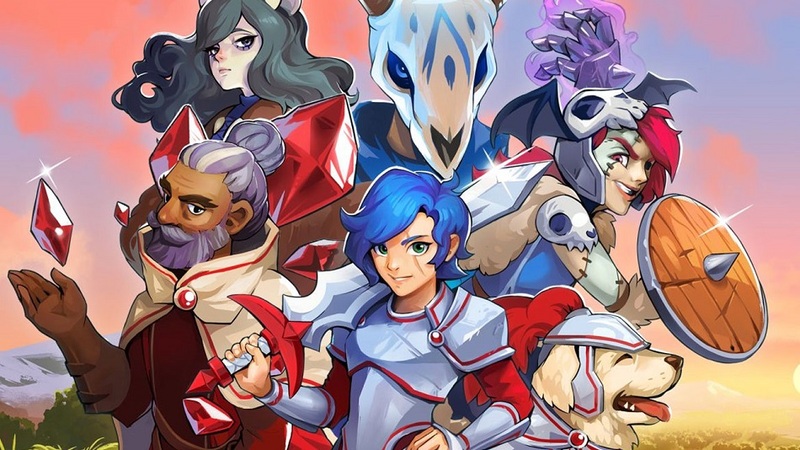 IMO, now that Wargroove has good changes applied, I’d score it 11/10. I am currently in two separate MP games with people on different platforms and, yeah, it is the MP that makes it great.